Is that a lot of polka dot, or is it just me…? Although it may, at times, feel like I’ve been pregnant forever, with a gestational period that could rival an elephant (22-24 MONTHS!!!?!??! ), I really have loved *almost every minute of it. I was determined to approach the constantly changing body of mine with a positivity that can only come with a complete surrender to what you’re about to go through. Yes, your stomach is going to get real big. Yes, things will stretch and bloat and swell and no longer resemble their original namesake (I’m looking at you ankles). And yes, nothing will fit. What I am suggesting however, is that pregnant women are pretty darn amazing, and I have loved watching friends of mine grow and bloom alongside me (even if they have popped before me…not bitter at all), and seeing their partners find wonder and joy in their new and really, quite fleeting, rounder bodies. I’ve never felt quite as beautiful as when I was able to crack out a bikini and display a really, truly pregnant belly at the beach. I felt proud of this body and what it was carrying, and gosh darn it, it should be out for all to see. I don’t care about the waddle or the general swollen nature of of my limbs now that I’ve hit the over-ripe stage. I’m quite busy creating and maintaining a life in this belly, and that’s no mean feat. So let’s all have a good look at it. I’m also so thankful for the opportunity to objectively reflect on my previous body image, and the serious body dysmorphia that I was dealing with for years. Until you have lost all semblance of a waist and have increased your breast size at least a couple of sizes, you can’t appreciate the shock with which you look at relatively recent pictures and think “Holy crap, I looked pretty alright.” It’s helped me see clearly how differently and negatively I viewed my shape, and really, what a waste of time that is. I know that after this baby has finally made its grand entrance, my body wont simply snap back to its former glory (this is made easier by it never having been particularly snappy in the past). I will probably have days where I look at it and don’t recognise or appreciate the new flabby parts, or the parts that show the war scars of having fought the good fight against the spread and lost. But I know that this body gave life, adapted amazingly well to what was going on inside and out, and produced a new human being. And that means I can only love it more. So here’s to you body. You did a bit of alright. *Except those two times that I was in a church for more than 2 hours in over 40 degree heat without air-conditioning. Pregnant Caroline + church + heat = all kinds of sin that result in feet the size of shoe boxes. I was suitably smote. 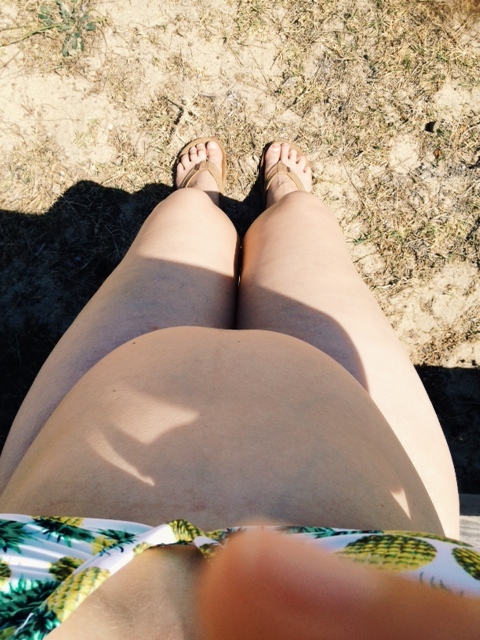 This entry was posted in Birth, pregnancy and tagged body dysmorphia, body image, pregnancy, pregnancy symptoms. Bookmark the permalink. Daughters of Eccentricity is a blog about creativity and parenting, written by two daughters of creative parents who are now creative parents themselves. Get some DoE in your life! Enter your email address to receive updates straight to your box! Eight and a half Ways to Smash the Patriarchy Today – International Women’s Day!